We provide a range of options for getting in and out of your vehicle, including the following. Swivel seats in general are designed to help people with mobility problems get in and out of vehicles. They swivel out by 90 degs and can be the perfect solution for someone who struggles to get over the sill of the vehicle and safely onto the car seat. 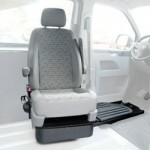 Swivel seats are a great alternative to wheelchair accessible vehicles. Person hoists are very similar to the hoists that are used in the home such as bath hoists and bed hoists. The person sits in a sling (small, medium or large) and an electric motor will raise them out of the wheel chair. 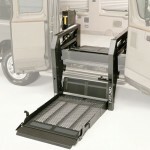 Wheelchair lifts provide a secure and reliable way for people to access wheelchair accessible vehicles. They are an alternative to ramps which have to be fitted by lowering and cutting out floors. Wheelchair lifts come with a remote handset so the person using the lift can operate it alone. 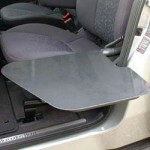 Tip up plates offer a smooth, frictionless surface to allow easy transfer onto a car seat. The plate covers the gap between the car seat and the edge of the sill which many people can find difficult to clear when entering the vehicle. They can be fitted on either the passenger side or the driver side.